The film takes place between seasons five (episode "The End") and six (episode "The Beginning") of the television series, and follows agents Mulder and Scully, removed from their usual jobs on the X-Files, investigating the bombing of a building and the destruction of criminal evidence. They uncover what appears to be a government conspiracy attempting to hide the truth about an alien colonization of Earth. Looked good; felt kind of aimless, though. an example of the "very long episode" problem. It's... just ok. (obviously) focused on the mytharc which wasn't my favourite part of the series to begin with. I was a casual fan when this came out, saw it in the theater, and didn't know what was going on ~80% of the time. I re-watched this recently and still liked it. I liked the old mytharc stuff up through this movie. Season 6 onward just got iffy. Also, isn't this one titled Fight the Future? The official title at the time was just The X-Files, as far as I know. 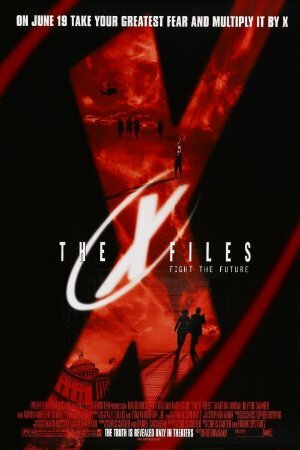 "Fight the Future" was used heavily in marketing materials, though, and AFAIK it's been adopted as an unofficial subtitle to distinguish it from I Want to Believe. Yup, it was just "The X-Files" until the second came out, when the marketing tagline/working title became the semi-official title. When I've seen it on cable a few months ago, it was listed as "The X-Files: Fight The Future". I saw this in the theater. Here is what I remember: 1. ice 2. bees 3. maybe a spaceship? in the ice? full of bees?